Below highlights the philosophies and views of the training arm within the Compete Academy – the Mavs Performance Institute (MPI). You can find more information about them here. Our View of Sports, Development and Training. Our primarily focus is in helping student-athletes advance to elite levels while developing and cultivating skills that will transcend beyond the playing field. The above performance pyramid illustrates the basis of our programming at MPI. Advancement to elite sporting levels is founded through strong General Physical Prep and Specific Physical Prep Phases. An athlete with a stable foundation has the capacity in which to grow the technical-tactical phase and then expand their mindfulness in the psycho-behavioral phase. In architectural terms, the “build-out” from the foundation can be expansive – but only as expansive as the foundation allows. Like all structures, the apex of our pyramid will either grow or be limited by its base. Like a building, the height and breadth of the structure is directly dependent on the dimensions of the foundation. A multi-million dollar smart home placed on top of a marsh is worthless. And so it goes for the human athlete. A technically efficient swing posted on Instagram for 1000 likes is only worth 3 fire emoji’s without the physical disposition in which to compete at the elite levels; additionally, an underdeveloped psycho-behavioral phase leaves supremely athletic and technically efficient players at a performance disadvantage; and so on. Further, the structure must be in harmony with its component parts. A football specific strength-training program provides negligible benefit to the elite baseball player; an advanced oxidative system does not provide significant benefit to the high powered, low capacity football player; and so on. The unfortunate reality is that so-called “Training” and “competition” for most student-athletes – from the general physical prep phase to the apex – is wholly mismanaged. This mismanagement is the singular biggest performance impediment to student-athletes today. The General and Specific Physical Prep Phase serves as our foundation to EVERY athlete’s pyramid. The abilities developed in the phase serve as the prerequisites for sport specific skill acquisition and whole athlete development: coordination, speed, power, strength, balance, rhythm, timing, mobility, stamina, reactive ability. 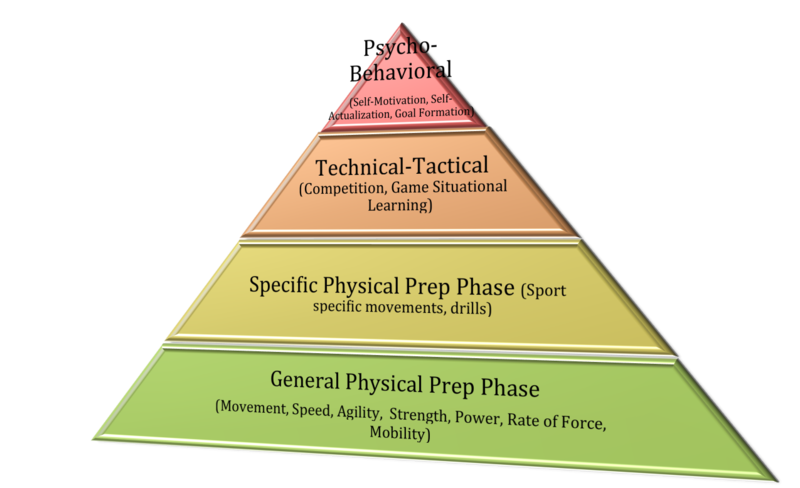 Despite the value of the General Physical Prep Phase, the current athletic climate focuses predominantly – if not exclusively – on the Tactical-Technical phase. Although this phase of formalized competitive game play represents the infrastructure of our pyramid – and is the most socially engaging and entertaining phase (especially for parents) – we are forestalling the foundational phases (General Physical Prep and Specific Physical Prep). Conversely, for today’s student-athlete, the calendar year is primarily comprised of year round competition (multi-seasonal travel, club, rec games), sporadic periods of focused “practices” and intertwining sport specific “development” camps. Parents shuttle their kids from tournament to tournament; from formalized game to formalized game, to inefficient practices. The athlete’s and parent’s resources are spent traveling and playing in formalized games, instead of being spent on training the physical phase. So instead of a pyramid, we are left with an egg as the Technical Tactical becomes bloated, taking from a solid foundation of General Physical Prep and Specific Physical Prep . As a result of the physiological differences and resource scarcity, the ability to effectively develop, implement, and cultivate an optimal training program is severely limited. At the youth level, success in the Technical Tactical Phase – defined by winning – is based solely on the physical preparation of the athlete. The more physically prepared the athlete – a misnomer as it is usually based on genetics or early puberty – the more dominant they will be in their respective sport with limited specific skill acquisition. Every August, the world bears witness to this at the Little League World Series – where physically superior 12-13 year olds advance predominantly because of size, speed and strength rather than technical acumen. It continues through high school, where multi-sport athletes effectively compete and succeed based solely on their general physical capacities. As noted, a youth that physically develops earlier than his/her peers will be at a significant advantage in game play. This advantage is too great for those without the genetic prerequisites – independent of the amount of “sport skill training” the athletes are receiving. In short, the bigger, stronger, faster kid will always have a significant advantage in game play no matter how much money is spent on hitting/pitching/sport specific lessons. This creates a problem for both genetically superior athletes and their inferior physical counterparts. the more their physical advantage gets conflated with better skills —→ the less investment they make in the General and Specific Physical Prep Phases —→ the relative decline of their physical superiority and underdevelopment of sport specific skills —→ the less talented they become in the long term and the more subjected they are to physical and psychological injury. The path of the physically underdeveloped youth athlete is similar. Counter intuitively, because of our social dispositions, parents of physically ill prepared youth athletes will spend a great deal of money on sport specific lessons (hitting, pitching, etc.) and travel the globe year round to compete in meaningless tournaments. The end result: lesser physically prepared athletes are now INCREASING the asymmetry in training phases, which furthers the overload of stress on their underdeveloped bodies. Ironically, this increased focus on the technical-tactical phase comes at the expense of the Physical Prep Phases, which is required for their growth and advancement to elite levels. In short, the more the physically ill-prepared athlete practices sport specific skills: the less they invest in the General Physical Prep Phase —→ the weaker their foundation will be —→ the less talented they will become in the long term and the more subjected they are to physical and socio-behavioral injury. The issue isn’t, necessarily, that there are “too many games” as some suggest. Rather, it is simply investing too heavily in the Technical-Tactical Phase. By comparison, the 20th century athlete lived in the Specific Physical Prep Phase acquiring skills across a wide variety of activities (sandlot games, stickball, running bases, home run derby, etc.) and getting reps everyday. Their “training” was simply limited by the amount of daylight or length of “dinner time.” Today, parents shuttle their kids from tournament to tournament creating the illusion that the modern athlete is playing more. However, because of the formal structure of tournaments and competitive game play, the modern athlete rarely develops the Specific Physical Prep Phase in the pyramid – and accordingly receives MUCH FEWER LEARNING REPS than the athletes of yesterday. Ironically, it is not that there are too many games; rather, there are too few of the right type. There has been a two-sided attack on participation trophies recently. Again, the true issue is founded by the mismanagement of our performance pyramid. Competition in the Technical-Tactical phase is about learning techniques and situational awareness to complete the objective – winning. A participation trophy is in discord with this end goal. The issue; however, is since all athletes are now living in the Technical-Tactical Phase, the only time we can develop the Apex of the pyramid (self-confidence, self-esteem, etc.) is during this phase. So the goal of the Technical-Tactical Phase gets muted; and, the phase that was supposed to develop an understanding of elite performance (winning) gets conflated with surrounding phases. We then have misguided parent reactions, misplaced focus, and ultimately – confused and overloaded student-athletes. Our optimal process has significantly more “training” and “fun” games – in which participation would be the reward; and very few “live” games – in which winning would be the reward. The proper management of the student athlete becomes increasingly difficult as there is usually no off-season from competitive play. The physical development of today’s student-athlete is dependent on the physical adaptation to the sport in which they are competing in. The body reacts to the physical stress in unique and varying ways based upon the athlete’s physiology, genetic makeup, external environment, etc. However, all athlete’s have a finite capacity to handle load. Unfortunately, by mismanaging the focus, physically and emotionally underdeveloped athletes are now increasing the stress and load on their limited capacity foundations. It is simply a matter of when – not if – the structure will being to breakdown. The evidence for this breakdown can be seen by the epidemic of non-contact injuries and a host of psychological and social problems inflicting athletes. As noted above, early sport specialization IN TERMS OF COMPETITIVE GAME PLAY is detrimental to both genetically superior and physically ill-prepared athletes. Most athletes plateau in their respective sports quickly as technical improvements are inhibited by a lack of a strong General and Specific Physical Prep Phases. As athlete’s progress in age, increasingly stressful technical movement outweigh the body’s ability to sustain the load placed upon it. The result has been a signficiant increase in injuries and psycho-behavioral “burnout.“ However, the reponse is not, necessarily, to increase multi-sport athletes. Rather, the correction is to effectively manage the process in proper harmony with the individual needs, comprehensive capacity, and goals of each athlete. Effective management and focus of the student athletes time, including recovery management, is necessary for long-term student-athlete health and success. Currently, student-athlete’s are on multipe teams with multiple coaches, the result being an overload of one phase (Technical-Tactical) and compartmentalizing the othersQuite often, this leads to an overload in both volume and stress on the student-athlete – which results in a reduction of capacity, a decrease in performance and an increase in injury potentiality. Each young athlete requires varying degrees of emphasis regarding performance development. Younger athletes require higher volumes of General and Specific physical preperation – which would come at the expense of short term competitive game play. This does not require a wholesale absence of Technical-Tactical Phase training – an optimal training program includes continuous training of all phases not one phase, then the next, and so on. However, the ratio of phase training will be dependent on the needs and capacities of the individual student-athlete. By increasing the focus on the General Physical Prep Phase, an athlete’s technical-tactical potential would increase as their physical capacity (foundation) expands. As outlined above, the resources required and the body’s ability to handle stress is finite. There is a tradeoff between and within each phase of the pyramid. Consequently, an optimal performance training ratio exists between the phases of our pyramid. Therefore, the extent to which General Physical Preparation training , Specific Physical Training, and Technical-Tactical game play must be coordinated according to the individual needs,capacity, and goals of each athlete. Our objective at MPI is to effectively help manage, organize, and cultivate an efficient and effective training program for every one of our student-athletes. In conjunction with the student-athlete and his/her family, each phase will be optimally planned and serve to expand growth as a whole at the least expense of resources. Lessons, sporadic group training sessions, and focus on micro goals is a waste and mismanagement of you and your childs most valuable resource… TIME. Athletes of different abilities training in the same way does not produce elite results. Instead, the needs, capacities, and goals of every athlete must be accurately assessed and a comprehensive Athlete and Sport Specific Training Program – that seeks to provide a strong foundation while growing out all performance phases – must be implemented. For that reason, we are dedicated to the analysis, the planning, the development and the cultivation of individualized training plans that meet each unique student-athlete.